Here if the supportive surface is substituted with the reaction RA then that is an example of free body diagram. The point of application of the reaction RA will be the point of contact A, and from the law of equilibrium of two forces. 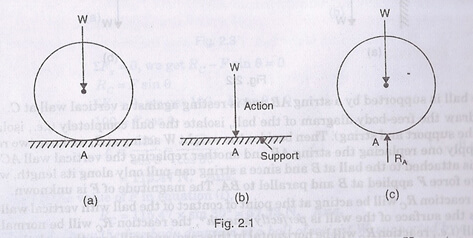 We will concentrate upon that the reaction RA must vertical and equal to the weight W.
Hence Fig.2.1 (c), in which the ball is completely isolated from its support and in which all forces acting on the ball are shown by vectors, is known a free-body diagram.